Successful professional cyclists are seen as more handsome than their struggling colleagues, according to new research. 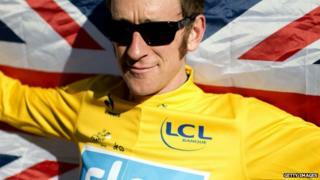 Women rated facial attractiveness among riders in the 2012 Tour de France, won by Britain's Sir Bradley Wiggins. The top 10% of performers were rated on average as 25% better looking than the laggards. The scientists conclude that humans have evolved to recognise athletic performance in faces. The research has been published in the Royal Society journal, Biology Letters. Some biologists argue that evolution has shaped women to select mates on the basis that they would either make good fathers or would pass on good genes. Healthy, physically fit men would on average be seen as more attractive by women. A number of other studies in recent years have suggested that women have a sophisticated radar for athletic performance, rating those with greater sporting skill as more attractive. This new work, though, set out to test if the same applied to more inherent physical qualities such as stamina and endurance. Dr Erik Postma, from the Institute of Evolutionary Biology at the University of Zurich, asked people to rate the attractiveness of 80 professional cyclists from the 2012 Tour de France. The cyclists were all of a similar physical stature, were tanned and around the same age. Around 800 participants were then asked to score the cyclist's attractiveness based just on their facial appearances. Their scores were excluded if they recognised the athlete. Dr Postma then compared the attractiveness scores with the cyclists' performance in time trials and in the race itself which, at well over 3,000km (1,860 miles), is a renowned test of endurance and speed. "To my initial surprise, I found a positive relationship between the two and it was actually quite strong," he told BBC News. This is the list of the most handsome cyclists in the 2012 Tour according to the research. Although he was the top pick, French rider Amael Moinard (pictured), finished in a modest 45th place. "If we took the 10% best riders and compared their performance to the 10% worst, we found the best were on average 25% more attractive than the worst ones." "We don't know what people are picking up in the faces that is signalling the riders' performance." One element that significantly interfered with the overall results was contraception. Dr Postma and his team found that women who were on the contraceptive pill were less likely to link attractiveness to performance. "Typically, studies find that women using the pill have a reduced preference for masculine faces, and we found the same phenomenon: women on the pill had a reduced preference for faster cyclists," said Dr Postma. Many men argue that they find it difficult to rate the attractiveness of other males, but in the study the researchers found that men who took part had a fairly similar view on who was handsome as the women. It suggests that men do have this inherent ability to judge who is handsome, according to scientists, and they believe it has evolved to help men rate their competitors. The scientists say that smiling didn't make a big difference in the survey. Men who were beaming were rated as more likeable but not as more attractive. Other scientists who looked at the study found the performance measures "convincing". "It summarises performance over a long time and should therefore be especially meaningful," said Dr Johannes Honekopp from the University of Northumbria. "We should bear in mind that the sample is highly selected and should therefore show little performance variance in comparison to a more representative male sample of that age. "This limitation should lead to a reduction in effect sizes. Any such effects might be stronger in a more representative sample." And what about British favourites, such as 2012 winner Sir Bradley Wiggins and leading sprinter Mark Cavendish? "Unfortunately, Team Sky decided to wear sunglasses for their photos and to improve standardisation I decided to not include them. That is really a pity," said Dr Postma. Why is cycling so popular in the Netherlands?